It is Hilarious how Clinton Liberals are now trying to be pro-slave wage prison labor at Southern plantation/gov buildings and sympathetic to racist stereotypes about IQ and emotional intelligence now that the racist segments of Hillary Clinton’s ’96 book are going viral. And by “hilarious” I mean morally repugnant. I’m going to post an article that features Sec. Clinton’s own words on this. Warning, the way she talks about the human beings who served her is incredibly demeaning, Uncle Tom’s Cabin levelshit. Also remember, the 13th Amendment explicitly carves out an exception for PRISON SLAVE LABOR, which is what is being described here. I’ve seen liberals try to say “but inmates WANT to work” or “it’s good for inmates”. Remember, these are the exact same excuses slavery supporters used to justify chattel slavery. Also, I’ve seen liberals say “well, this IS legal”. So was chattel slavery. Inmates used for labor are often unpaid or only paid a tiny, pitiful fraction of minimum wage, often as little as a few cents an hour. They often must work over 10hrs a day in unsafe, undignified, or unsanitary conditions while wearing humiliating prison garb and be overseen by armed guards with absolute authority over their bodies. The vast majority of unpaid or token-paid prison labor is done by black men. Here are links to Clinton’s casually racist and cavalier attitude to the imprisoned black men who served her and an article putting it all in context. 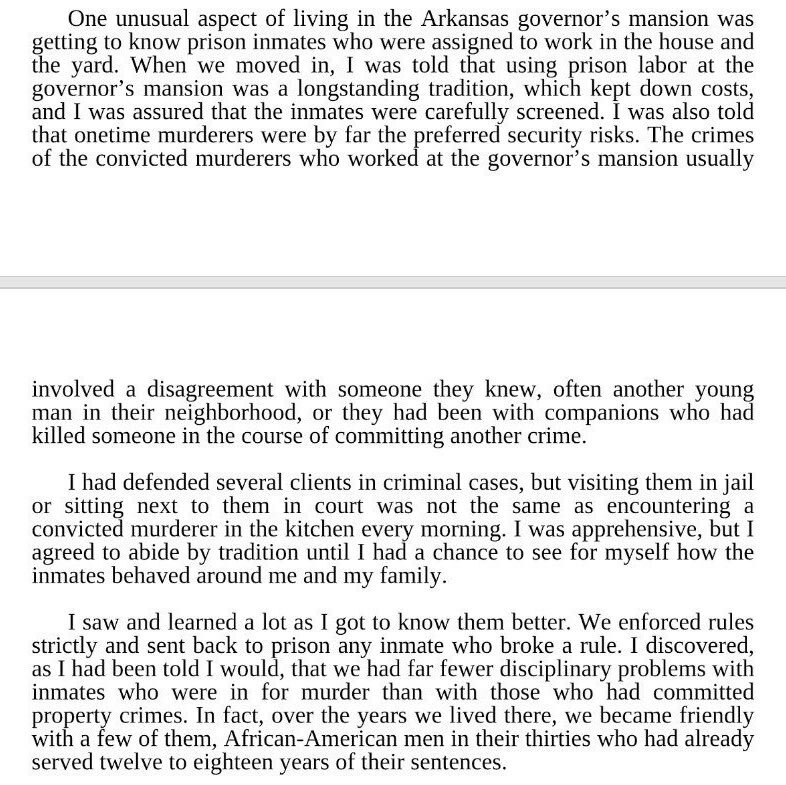 Note how Mrs. Clinton seems most concerned for her own safety and how this “peculiar institution” at the Arkansas Governor’s residence confirms or denies her personal prejudices about “criminals”. Also note how she acts as though she is helpless in the face of an entrenched institution, even though in reality she and her husband, then Governor Clinton, were in fact uniquely empowered to do something, anything, to mitigate or eliminate this injustice. This is not a mere pathology of the Clintons, but a pathology of the country we all inhabit. And it is not just a single noxious political family that is complicit. We all are.